With over 3,000 in attendance, it was standing room only at Mt. 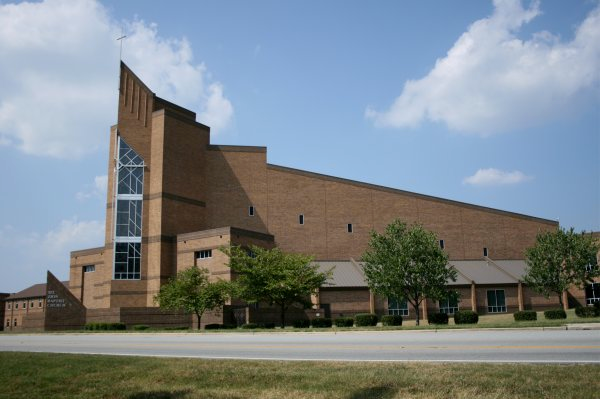 Zion Baptist Church in Greensboro, NC tonight for a city wide celebration of Martin Luther King Day. The service held tonight was the culmination of a full day of community activities celebrating Dr. Kings life. 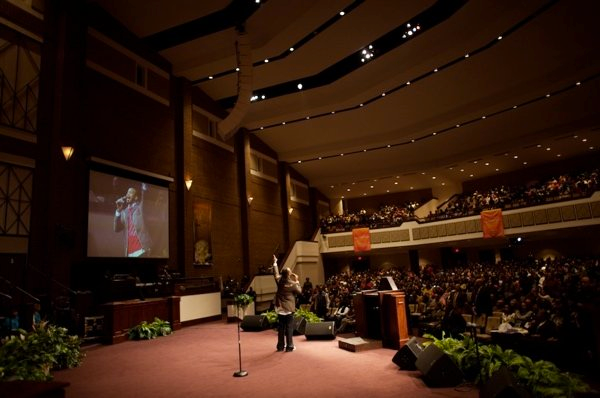 The power-packed event featured special guest artists Phillip Bryant, Lil' Mo and multiple 2008 Stellar Award winner, Dewayne Woods backed by a one hundred member community mass choir. Dr. John Guns of St. Paul Missionary Baptist Church in Jacksonville, Florida was the featured guest speaker. The event also marked the debut of Mt. Zion's new sound system to the community at large. The sound system was designed and installed by local systems integrator CareySound. Company owner, Ken Carey, along with Tommy Martin, VP of Sales and John Carey, HE, were on hand to handle the engineering duties for the evening. System designer, Ken Carey of CareySound faced several challenges in designing the new system. "The 10 year old sound system we just replaced had never really addressed some very serious issues in the room" Carey said. 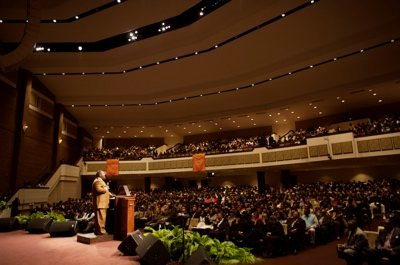 "This sanctuary is not only very wide but is was built completely backward to the way auditoriums are built with the tall part of the room in the front and the short part of the room in the rear end with a balcony. This arrangement effectively funnels all of the sound down into the back rows and presented many more reflective surfaces in the process. This was in addition to a very loud HVAC system" Carey explained. The original system consisted of a very large, tightly packed, Left-Center-Right trapezoidal speaker system with overlapping conical horn coverage. Additionally, multiple smaller cabinets had been added to the space to try to compensate for the very patchy sound distribution in the auditorium. "With the seat-to-seat variations in coverage and the loud HVAC system they were driving the system hard to try to cover the imperfections in sound distribution in the auditorium and the high sound levels very quickly swamped the room adding to the already complicated acoustics of the space," continued Carey. 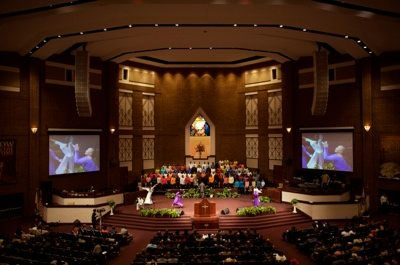 The solution to this unique combination of issues was the installation of a precisely focusable Electro-Voice Xlci loudspeaker line-array. Dual 13-element Line Arrays, each consisting of eight Xlci127DVX boxes hung under four Xlci215 subs, flank the stage powered by eight Electro-Voice P3000RL remote supervised Precision Series Amplifiers. "Utilizing the great sounding, high performance, Xlci loudspeaker system with the aid of EV's powerful LAPS computer aided aiming software, we were able to design a verifiably accurate system with complete confidence. All of the issues created by the original 32 box, 29 amplifier system along with the oddly shaped room and loud HVAC system were overcome with the new system. Everybody in the sold out auditorium tonight had the best seat in the house." Carey concluded. In addition to the new EV house system at Mt. Zion are new monitor speakers utilizing the new Dynacord VariLine loudspeakers. The new wireless microphone system is the EV REV UHF System with RE-410 mic capsules. Celebrating it's 30th year in business, CareySound takes great pride in offering it's clients the highest degree of expertise and customer service in both sales and specialty audio production services. For more details please contact us by phone at (336) 379-1943 or by email at ken@careysound.com.